It's that time again! Week 5 of Ask Away Friday with some of my favorite ladies, and we're growing each week. I first learned about AAF when my girl Tiffany at MrsTeeLoveLifeLaughter asked me if I would like to be featured during week 2. I had so much fun, I asked them to count me in for future Fridays and here we are! This week I was saved by my new friend Lauren @ Real Housewife of NOVA where she blogs about all my favorite things: the home, DIY, decorating and so much more. She recently joined a Facebook group I started with some blogging girlfriends and was kind enough to volunteer when I admitted that I spaced out on this week's AAF link up. We already got to chatting a bit, and she is the kind of person that is really easy to like, this shines through in her writing too! 1) How have you changed since becoming a mom? I always say I'm a big people pleaser. I have always had a tendency to put other people before myself, and though that hasn't changed entirely, I am now thinking about my family first and what is best for us and especially my girls. I'm not as much of a push-over. When it comes to my girls, there is nothing I wouldn't say or do if I felt like they were being wronged. I guess that's just what Moms do, but it's hard to truly understand the feeling until you're there. I'm also not nearly as sane as I used to be. 2) If you could choose one celebrity to have as your bff, who would it be? I'm sure if I think about this one longer I might come up with a different answer, but after just finishing a season of So You Think You Can Dance, I immediately thought of Cat Deely, the show's sweetheart of a host. I have always thought she seems like the nicest, most down to earth person. I would have to find some major self-esteem mojo though because that woman is a bombshell, and I'm just...not. Anna Kendrick would be fun too. She's hilarious. 3) What is one thing your parents did or rule that they had that you will do differently with your girls? 4) What is one tradition that you want to preserve for them? Hmm...There are a lot of little holiday traditions that my parents did that I've continued with my girls...My parents used to make baby powder Easter bunny footprints, and have always celebrated Christmas Eve more elaborately than Christmas Day. My mom makes overnight French toast and we have breakfast together, even now that we have the kids we go over in the morning and eat with them. It's all the little details that make every holiday with my family so special and I want to preserve that same feeling for my kids. It's a toss up. I love Christmas for all the reasons mentioned above, but I am getting increasingly disenchanted with New Jersey winters. I really love Halloween too. We are BIG into the costumes and have a Halloween party every year with friends. We all get super competitive with our costumes and I've handmade many of them. I'm planning on doing a post in the next few weeks to share some of the parties of Halloween's past because there are some great costume ideas. 6) What was one project that had your husband questioning if you had lost your mind? 7) If I came over for dinner, what would you make for me? If takeout is your specialty, what are we ordering? Haha...Oh, I hate to admit it, but I don't cook, so if you came over and expected a meal out of me it would probably be grilled cheese and soup (from the can.) I can make some good breakfast though...omelets, french toast...and dessert. I like baking. Take out would probably be our best bet, and then I could treat you to the most bazaar but DELISH pizza I have ever had..ready for this one? Spicy mustard and garlic pizza. It's exactly what it sounds like, and if you like mustard it is SO good. It's basically a pizza made the usual way, but with a layer of brown mustard added before the red sauce and cheese, then some garlic. 8) What would I be surprised to know you draw the line at DYI-ing or crafting? I hate painting. I do it and I don't mind painting furniture or if its a small step on the way to a finished product, but to just paint a room? Torture. I get really lazy and sloppy about it. It's a different story when there's detail involved. Ill paint a mural with a tiny paintbrush, but you can keep your roller, thank you. 9) What is your fav. snack food? I love Snyder's Buffalo Wing Pretzels. They are so good. 10) Do you know any of the bloggers you read in real life? I do! Two lovely and seriously funny ladies who I was lucky enough to meet through work. Jen blogs over at Drinking the whole Bottle and Merritt who blog with her partner in crime, Mary at Merritt and Mary. Go check them out, seriously, you'll like them. So those are my answers to Lauren's fabulous questions! Don't forget to stop by her blog to check out how she answered the questions I asked her. Don't forget to stop by and read what some of the other participants have to say and let them know you're reading! I think your answers are always so fun. Mine these week are pretty serious. Camii asked me very deep questions for me this time around lol. Lol at painting! Did you paint murals in your girls' rooms? Another art project maybe? Thank you!! Your answers were pretty deep, but beautiful. I don't have murals anywhere in my house! The only one I've ever done was the one I posted for one of the previous AAFs and I was paid to do it. Painting has never been my favorite art form. I can't even paint my nails! lol Look whose talk Britt, you took me way back on lessons learned :). Its great that you valued the parenting skills of your parents and passing on to your own. I hope I'm doing that with my kids now. I always remember growing up saying to myself I'm going to be a different mom. Hope I did make a difference. 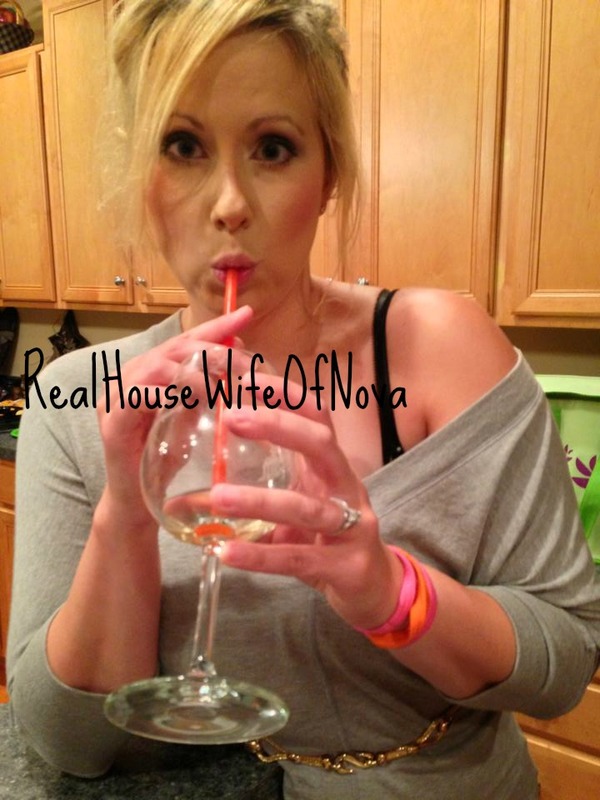 It was fun reading about you and the glass of wine with a straw Love IT!!!! I'm sure you did make a difference. I think learning from what we experience always impacts the was we do things, but sometimes we become our parents without even realizing it!! HAHA..that pic is great isnt it? That's actually Lauren, the woman I exchanged with. 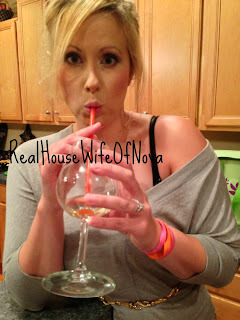 She answers my questions at Realhousewifeofnova. Thanks for coming over Camii! Cute! I think most people will get a kick our of such an awesome DIYer/Art teacher say "I hate painting" ;) Even the most fab DIYers can get annoyed with DIY. I actually love anytime I can get my hands on a paintbrush or paint roller! It's weird, I'm not super skilled but give me some paint and I'm gone... off in my world. Your parents sound so sweet :) We make Christmas Eve just a special as Christmas day for the kiddos here too. Halloween has always been my favorite holiday but Christmas is creeping in... it's so special with the kiddos. Funny isn't it? I think it's a patience issue in general (I'll mix colors, then have to walk away from the project, come back and they're all dried up! SO frustrating.) And with painting walls, its just so boring to me. I'm a details gal (in case that's not glaringly obvious ;) I heart Christmas. It would be perfect if it snowed on Christmas, and then spring started in January. It is SOOOO good Tiffany. I don't know if pizza places generally serve it, it's just this one place by my house and my neighbor got me in to it. Ive only had it once because my husband doesnt like it and I have been dreaming about it ever since! EEEK, I have so many comments! I am stealing the baby powder footprints this easter for E! We also have always made a bigger "to do" over xmas eve..are you Italian by any chance? Love Anna Kendrick! I can't wait to have my mustard pizza (it wasn't JUST a question, I truly did invite myself over : P) I am the only person in my family who eats mustard LOVE IT! love this blog! LOL! It was so fun exchanging with you Lauren! I love your personality. I wish we lived closer so we could hang and share a mustard pie and watch Pitch Perfect. You're welcome any time you're in Jersey! I love your gallery! I have always wanted to do something like that in our house to show off my kids' art works but haven't gotten around to it! Thanks!! I have something in the works for Violet's artwork, but it probably wont come to be for a long time. I'll make sure to share it with you when it does!! I'm with you on the cooking, and I think soup and grilled cheese sounds perfect! 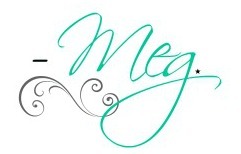 So glad I found you through AskAwayFriday - have a great weekend, Meg! Thanks so much Dana! Soup and grilled cheese can be great on a nice fall day, right? I love that gallery wall and also the green cabinets! I would never have thought to do either one! Then again, I am not much of a DIY'er. I wish I was though. My Pinterest has tons of great DIY projects...most of which I will never do! Pinterest is so inspirational, yet so overwhelming sometimes, isnt it?? Thanks for stopping by Michelle! Would love for you to visit the US and look me up! Oh MY! Your house is precious! Loooove the mint green cabinets in the kitchen. I struggle in the kitchen myself. Thank goodness for hubby! Thanks Taylor!! Can't wait to exchange questions with you this week!! We are kindred spirits in the kitchen! I love to eat, I mean Lurvvee to eat, but I can't stand the cooking part. I'll reheat leftovers three days in a row to avoid making a new meal. But I have promised myself for the sake of my girls to get better in there.